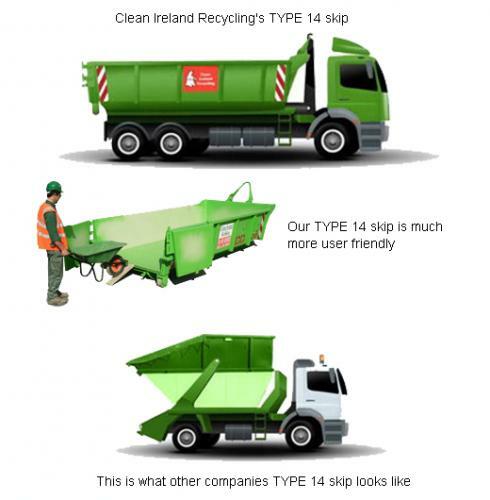 The “TYPE 14” skip from Clean Ireland Recycling has a much larger footprint than the conventional type. This basically means that you can put more material into it, giving you much better value for money. Clean Ireland Recycling’s TYPE 14 skip is serviced by a 3 axle 26 ton truck. All other waste operators service their TYPE 14 skips with a 2 axle 18 ton truck. More capacity means more value to our customers. 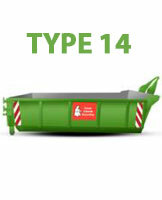 For a price on our TYPE 14 skip, please contact our office or send an enquiry by email. The ideal skip for Medium to Large size clear outs, DIY, Home or Commercial renovations, Medium to Large size building projects, etc.